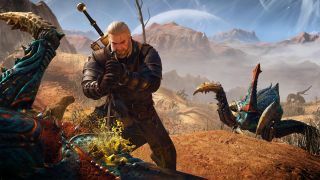 Monsters are a big part of The Witcher games, what with Witchers being professional monster exterminators and everything. And so it's not at all surprising that CD Projekt takes them so seriously. "In order to become the best monster hunter, you must first learn how to understand your foes," Senior Gameplay Designer Damien Monnier gravely intones in this new video focusing on, keep up at the back, monsters. "Books and hearsay usually gives you the information you need: Where they can be found, their attack patterns, and what they fear. And it is your job to figure out the best way to kill them." Offing monsters isn't new by any stretch, but this is: Geralt can now swim underwater in pursuit of his foes. I'm not sure that's such a hot idea, given the hardware he traditionally brings to the party is mostly made of metal, but you go where the work is, as they say. And since he'll be using a flimsy little sailboat to get around in the game, I suppose it's only natural that he'd end up in the drink now and then. The Witcher 3: Wild Hunt comes out on May 19, which is now just two weeks away. Are you ready?